Average house prices in the UK are accelerating again, according to the Department of Communities and Local Government (DCLG). Its latest survey shows that in July prices across the country rose by 2% to an average of £218,479. The annual rate of house price inflation rose from from 12.1% to 12.4%, its highest since March 2005. The main factor was soaring prices in London, where house price inflation is now 19.1%, and the South East. In the South East the inflation rate rose from 10.7% to 11.9%. Outside those two areas, prices in the UK in fact slowed down and were rising at a rate of just 10.6% a year, compared to 10.9% in June. This latest pick up in average UK house prices comes despite higher mortgage costs due to the five increases in interest rates that the Bank of England has imposed since August 2006. It also contradicts the opinions of mortgage lenders such as the Nationwide and the Halifax who have argued that property prices are starting to slow down, although their claims are based on surveys conducted a month later, in August. "It currently seems unlikely that house prices will slow sharply," said Howard Archer of Global Insight. "While demand seems set to slow further, a lack of supply means that vendors in many areas still have some pricing power." The remarkable house price boom in Northern Ireland appears to be easing off. The province has seen house prices take off in the past three years. In July 2004 its inflation rate stood at 14.4%, almost exactly the same as for the UK as a whole. Since then prices in Northern Ireland have rocketed, particularly since the stat of 2006, with the annual inflation rate rising rapidly to hit 55.9% in June this year. In July though this dropped back noticeably, to 46.8%. One side effect of this boom has been to make house prices in the province higher than those in England, Wales, and Scotland. Northern Ireland prices overtook the UK average in January this year and then rose above those for England in March. 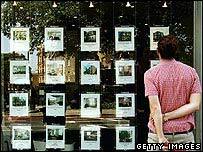 The average house in Northern Ireland now costs £242,391. Prices up or down in 2010?